Ceres is about the size of Texas. Though it comprises 25% of the total mass of the asteroid belt, it still is smaller than even the tiny Pluto, 14 times smaller. Though it is not considered a planet, it shares some of the characteristics of rocky planets like Mars. 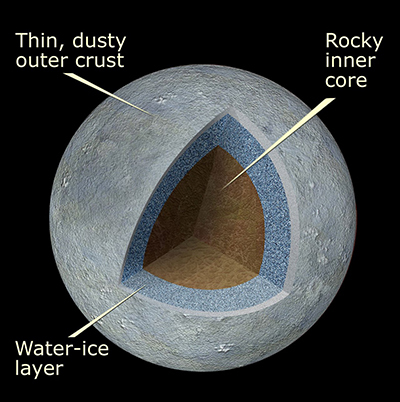 Ceres is believed to have a differentiated interior. Which means, it's more dense at the core than at the surface. Ceres is believed to possibly have more water than the amount of fresh water on Earth. It is believed so because Ceres is less dense than the surface of Earth, and surface bears evidence of water-containing minerals. No direct evidence yet exists that Ceres contains water indeed. Ceres was discovered by Sicilian astronomer Father Giuseppe Piazzi. He spotted the object as he was looking for a suspect planet between Mars and Jupiter. When he found it, he called it a planet. Later, it was classified as an asteroid. In 2006, it was promoted to the status of a dwarf planet, in line with Pluto and Eris. in recognition of its planet-like characteristics.